FEAR is one intensive game and only light Anti-Aliasing will provide decent framerates with the GeForce 7900GTX. Turning on AF does not degrade performance very much, even when 16x AF is enabled. Please note that there is a known issue with the Forceware 83.50 and FEAR. nVIDIA has addressed this issue and with the Forceware 84.17 drivers. The difference is said to improve performance by 25%. Soft Shadows and Anti-Aliasing are not compatible with each other. Most gamers are familiar with Anti Aliasing and Anisotropic filtering however the nVIDIA drivers offer more eye candy tweaks than that. Changing the "Performance & Quality Settings" view from "Basic settings" to "Advanced settings" opens up a new world of options that gamers. From "Anisotropic mip filter optimization" to "Transparency antialiasing" and "Gamma correct antialaising", there are more options that meets the eye. There is no best setting to change so gamers will have to test out the individual options themselves but it is worth it and can make a huge difference your favorite games! Comments and Feedback? Suggest a Tweak. It is refreshing to see how quickly both ATi and nVIDIA have gotten the latest graphics cores out the door, nothing is more frustrating for gamers than paper launches. Grrr... Paper Launches!! With that said, the new nVIDIA 'G71' core is not Earth shattering compared to the previous generation, the 'G70,' but it does provide a decent performance boost to a platform that is almost eight months old. The nVIDIA 'G71' puts the GeForce 7900GTX videocard on par with ATi's best and costliest. The MSI Computer NX7900GTX-T2D512E videocard is based entirely on the nVIDIA GeForce 7900GTX reference design, and thanks to its large heatsink looks pretty visually impressive. It might appear big and loud, but the fan on the NX7900GTX-T2D512E is dead silent under heavy 3D loads. What a refreshing change compared to the loud stock heatsink on high end ATi videocards like the X1900 XTX. As usual, the software package that accompanies the MSI's NX7900GTX is current, and includes a full copy of "King Kong". The new nVIDIA 'G71' core is essentially the old nVIDIA G70 core built on a smaller manufacturing process (0.09 vs 0.11 micron), and sped up. 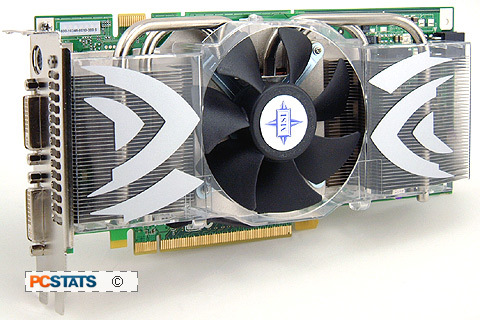 This gives new GeForce 7900GTX based videocards a decent performance boost over the previous generation. Because of the speed increase, power consumption has also swollen, and users should take careful note of which power supplies nVIDIA recommends... 400W and up. While we were unable to test XHD (eXtreme High Definition) for lack of a 20" widescreen LCD display, we can already see the benefits of widescreen gaming taking hold. XHD gaming promises a better experience than with standard 4:3 monitors, just as watching movies in the theatre is vastly better than any paltry 60" HDTV screen can offer. Looking over the benchmarks we can see that the MSI NX7900GTX-T2D512E videocard was very fast in 3D tests, and it's difficult to say whether this card or the Asus EAX1900XTX (Radeon X1900 XTX) is faster overall. nVIDIA's 'G71' sweeps benchmarks based on Doom 3 and Quake 4 quite easily, however it trails slightly in 3DMark06 and FEAR. MSI's NX7900GTX-T2D512E videocard was a decent overclocker, achieving a max core speed of 702 MHz and memory speed of 1.77 GHz in our tests. In spite of this, overclocking did not seem to affect 3D benchmark results very much. Aside from 3DMark05/06 scores though, there really is no need to overclock a flagship videocard like this. With a retail price in the region of $573 CDN ($499 USD/£287 GBP), the MSI NX7900GTX-T2D512E videocard is an awesome PCI Express x16 solution which includes SLI compatibility, HDCP, XHD, H.264 video acceleration and a wonderfully quiet although two-slot cooling solution. It is not much of a step up from the GeForce 7800GTX 512MB versions, but for anyone who is considering a card in that class, the MSI NX7900GTX videocard is certainly the way to go.